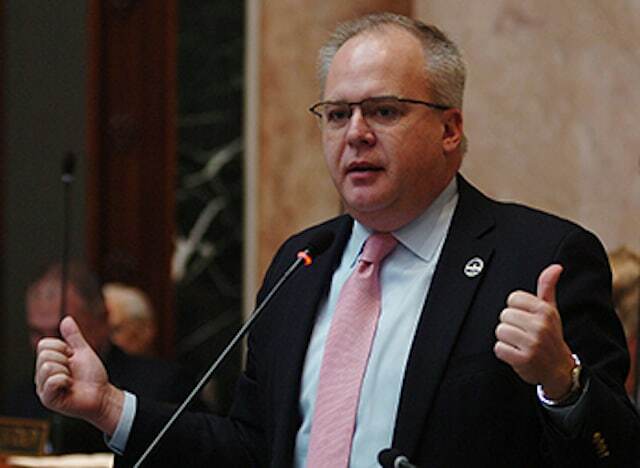 Koenig is among a number of Kentucky lawmakers that favor legalizing sports betting in the Bluegrass State, but he’s quick to point out that sports betting — or any gaming — will not solve the state’s pension crisis. Kentucky has one of the worst pension deficits in the nation, and talk about legalizing sports betting has centered around that revenue as a solution. But the reality is, whatever sports betting might bring to the state will only be a small part of the solution. Koenig has spent time over the last year educating himself on the intricacies of legalizing sports betting. There is no one-size-fits-all law that will work in every state, and Kentucky’s vibrant thoroughbred racing industry is a wrinkle that most other states don’t have to contend with. The state is home to the most storied track in the nation, Churchill Downs, and the industry is key to the economy — and identity — of the state. To that end, its likely that any sports betting law in Kentucky will call for some revenue to be earmarked for racing purses. To that end, next week’s hearings, which will are scheduled for 10 a.m. on Oct. 12, will be an educational opportunity for Koenig’s colleagues. He’s put together a seminar of sorts, including a professional who will provide an overview of legal sports wagering and representatives from the state lottery, a potential sports betting regulator for the state. Next Week’s Hearing to Be an Educational Forum, But Professional Sports Leagues Aren’t Invited. Noticeably absent from the agenda are representatives from the professional sports leagues. “The pro leagues have offered, but I think we need to get our people up to date first before we start throwing in the pro leagues,” Koenig said. “When the lobbyists got confirmation that they were (registered in Kentucky), they called me immediately to tell me. The first words out of my mouth were ‘You’re not getting an integrity fee.’ Vegas has been taking sports bets since 1949 and they don’t pay an integrity fee, so does that mean that they were not on the up and up? Among the registered lobbyists are Dan Spillane (NBA), Jeffery Hartgen (NFL), Morgan Sword (MLB) and David Miller (PGA). 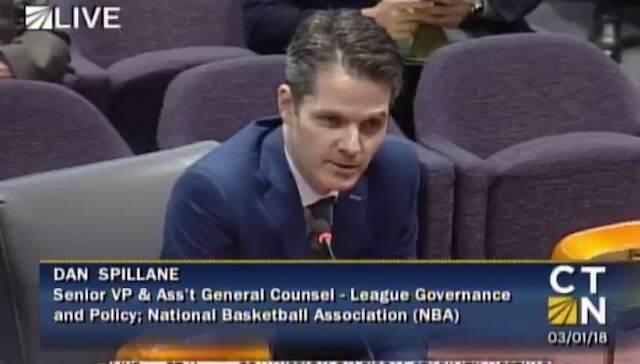 Spillane is no stranger to testifying — he jousted with state lawmakers in Connecticut (above) and several other states last spring, as the NBA publicly embraced sports betting, but commissioner Adam Silver said his league deserves a “royalty” because sportsbooks allow wagers on their games or their “product.” He was also a panelist at a recent seminar on sports betting in Kentucky. Pro-league lobbyists have had no success in getting an integrity fee in any state that has legalized sports betting this year, and Koenig is not alone in his no-payout stance in Kentucky. Lawmakers say the professional sports leagues will benefit from legal sports betting in Kentucky, and there are multiple studies that bear out their claims, both in Kentucky and in other markets with legalized sports betting. On Tuesday, the American Gaming Association released a Nielsen study that shows that the NHL stands to see a $216 million increase in revenue in a legal, regulated sports betting market. This is the second such study that the AGA has released — the first showed that the NFL would see a $2.3 billion increase. The four pro leagues that registered lobbyists in Kentucky have been pushing for different goals. The NBA has been the most aggressive of the professional leagues in lobbying for a “integrity fee” or royalty, as well as forcing sportsbooks to use official data. MLB and the PGA have aligned themselves with the NBA. The NFL has been less focused on an integrity fee while seeking a mandate — either federal or state — for the use of official data as well as the ability to dictate which wagers sportsbooks may offer — in the name of integrity, testifying as such in Washington last week at a House hearing. The NHL has been noticeably absent from lobbying efforts. With all of the activity, it seems a good bet that Kentucky will make a move to legalize sports betting at the start of the 2019 session on Jan. 8. 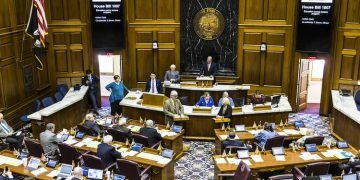 The session will last only 30 days, as per Kentucky state law, which calls for a shorter session during odd-numbered years.